Transportation, not gold or silver, was the cornerstone for Kingman, Arizona, a dusty desert town immortalized in a little ditty performed by Nat King Cole. It began with a Native America trade route that connected the tribes along the coast of California with the Zuni, the Hopi, and the tribes along a chasm that we know today as the Grand Canyon. Father Garces followed that trail during his explorations in 1776, and camped at the oasis latter named Beale Springs. A few intrepid explorers such as Francois Xavier Aubry, a French Canadian adventurer of legendary stature in the mid 19th century followed in the footsteps of Garces, and following him came a legion of American military surveyors, engineers, and soldiers. One of these was a naval officer whose adventures and exploits had become legendary. Lt. Edward Fitzgerald Beale had been present with the mission from Washington D.C. when the Republic Texas of became a United States Territory. He had served as a spy in Great Britain as disputes over the Oregon Territory simmered, and had personally delivered confirming evidence of the California gold rush to the president of the United States after an arduous and dangerous crossing of the Isthmus of Panama. In 1857 he accepted an assignment from President James Buchanan to survey a road from Fort Defiance in the Territory of New Mexico to Fort Mohave on the Colorado River. The second part of this assignment, determine the feasibility and viability of camel caravans for the use of military supply transport in the deserts of the southwest, emanated from Jefferson Davis, Secretary of War. The Beale Wagon Road would latter be extended further east from the Territory of New Mexico, but by the early 1880’s, the road was being replaced by the railroad. Beale, and the railroad, depended heavily on the waters of Beale Springs. So did the fledgling railroad construction camp named Shenfield. In short order the railroad reached the Colorado River, construction stretched deep into the Mojave Desert and the railroad camp now called Kingman (named for Lewis Kingman, a railroad location engineer), became the hub at a web of prosperous mining camps and ranching empires. Fast forward to the dawn of the 20th century. The last major gold rush in Arizona had given rise to Gold Road and Oatman, Kingman was thriving as the areas center of trade and commerce, and a new breed of tourist dubbed the automobilist fueled establishment and development of service industries. Funneling tourist into the Territory of Arizona was a Trail to Sunset that connected Chicago to the Ocean-to-Ocean Highway at Yuma. In 1912, the National Old Trails Highway incorporated this pioneering “highway” into the course followed from Maryland to California. It was a group of businessmen from Kingman led by Tom Devine, proprietor of the Hotel Beale, accompanied by business owners from Needles, California, that changed the course of transportation history in Kingman. They attended the 1913 National Old Trails Highway convention and made a powerful presentation about the merits of rerouting this road across northern Arizona, and through the Mojave Desert. In 1914, the National Old Trails Highway, and Kingman, got quite a promotional boost. The last of the Desert Classic races derisively dubbed the Cactus Derby followed the road from Los Angeles to Ash Fork before turning south toward Phoenix, and the list of headline grabbing drivers included Louis Chevrolet and Barney Oldfield. 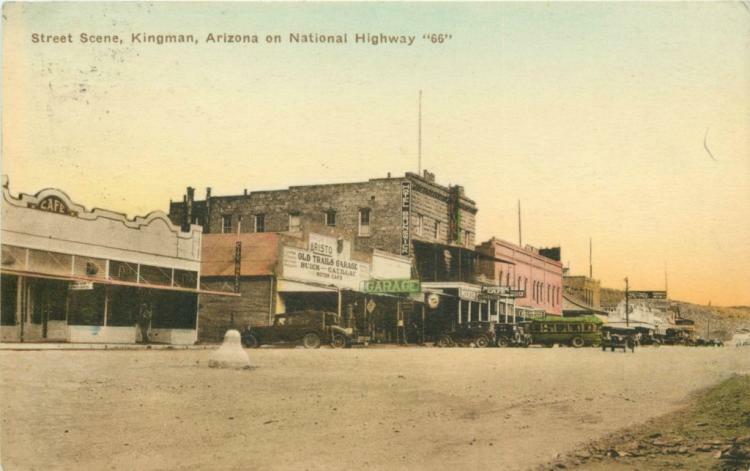 In 1926, the National Old Trails Highway across western Arizona and through Kingman received a new designation resultant of its incorporation into the recently created U.S. Highway system – U.S. 60, U.S. 66 after November 1926. The rest, as they say, is history. U.S. 66 gave way to I-40, which will soon be joined by I-11. Route 66 faded and then underwent a renaissance that is fueling a rather dramatic transformation in communities large and small, including Kingman. There may have been gold in them thar hills but it was the trails, the rails, the asphalt ribbon and the change in travelers pockets that transformed a dusty railroad construction camp into a destination for legions of international travelers.